Raleigh’s Council 9709 is staging the internationally acclaimed comedy “Late Nite Catechism” on Saturday, March 16, in Clare Hall of St. Francis of Assisi Catholic Church beginning at 7:30 p.m. Doors open at 6:30 p.m. This is a return of the great show that our council hosted last year. This is a hilarious comedy that pokes fun at Parochial School catechism as many of us remember it from our youth. Why not join and take a tour down memory lane and explore our childhood memories of catechism and Catholic school days. For the Irish among us, at 6:30 before the play there will be a heavy hors d’oeuvres St. Patrick’s Day reception in Anthony Hall of the Church. That reception has a door charge of $25, which includes your first drink of green beer, wine or soft drink. Council 9709 has already sent you the attached flyer, and you may have seen our advertisement in your Church bulletin, as we sent that advertisement directly to your Church staff member who handles bulletin announcements. The Raleigh council needs our support and asks that some of our Council members join them for the evening. Tickets can be purchased online at http://storefront.kofc9709.org or by calling 919-438-0033. Two buses left St. Thomas More Church for a two-day pilgrimage and a long ride to Washington, DC. Both were filled with our parish youth and their adult chaperons. Our kids over 550,000 other demonstrators on the march. The faithful from the Diocese of Raleigh and the Diocese of Charlotte attended a North Carolina Mass for Life at the Basilica of the National Shrine of the Immaculate Conception. We are raising money for those who need help. These are people not just from St. Thomas More Church, but from our community. Our church helps everyone! You can help! No, you don’t have to hold a can in front of a store. You can help use with our project to cook, prep, package and sell 1,000 pounds of pork shoulders. Jerry Pilarski will be up all night slow cooking a massive amount of shoulders. We need your help pulling and packaging them on February 2nd. This is really a fun event with fellow brother knights. We joke, kibitz (that’s to offer unwelcome advice or encouragement) , and have fun with each other. We call it bonding. How about it? Can you help? As many of you know, in the past Council 10910 has mailed either four or five seminarian raffle tickets to each of our Brothers. The idea was that we would either sell the tickets to others or buy them ourselves. This year we will not be mailing the tickets, but the Council still needs your support to make this annual campaign a success. The one half of the face value of each ticket is retained by the council. We, in turn, contribute this money directly to individual seminarians in the Diocese of Raleigh, Last year we were able to sponsor five seminarians with $500 grants. The prizes are great! There are two grand prizes. 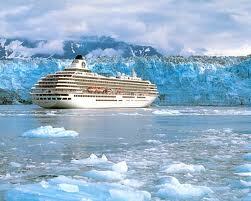 A cruise to Alaska and a trip to Hawaii. Of course, and above all, this is a project that supports our State Council and their many programs. Let’s help make it a success. Tickets are sold at St. Thomas More Church after Mass on various upcoming weekends, as well as at Pancake Breakfasts and Fish Fries. Please stop by the table in the Narthex and either buy tickets for you yourself or pick up tickets for resale. You are encouraged to assist in the ticket sales in the Narthex. All knights are also encouraged to make tickets available to family, business associates, and friends. Need extra? Just ask. There is no limit on the number of tickets that you can buy. 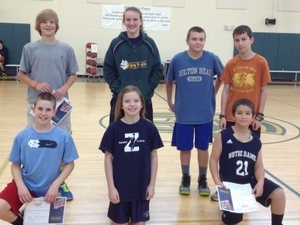 Here are the Council finalists of the Free Throw contest at St. Thomas More Church on Saturday. Start the New Year With a Pig Picking! This years Council Family Holiday Party will be on New Years Day starting at 3 pm. We are doing it in the country at a 4H Barn just off Orange Grove Rd, Hillsborough. Jerry Pilarski is cooking the shoulders provided by the Council for our enjoyment. Everyone is asked to bring a family favorite covered side dish or dessert. There is always the traditional corn bread, black-eyed peas, and greens. You are encouraged to show off a family favorite or ethnic dish. The 4H Barn has plenty of seating and lots of room for you to walk around to meet and greet others. It is a great place for kids or grandchildren. There is a large open area that looks out over Orange County and Dairyland Road. Kids love to stroll around and have fun with other kids. Attire is rustic. Enjoy you day. Wear jeans and a casual shirt. Relax! You can R.S.V.P. by clicking on this link: Submit R.S.V.P. 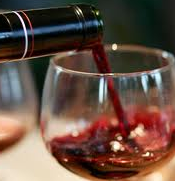 There is a charity wine tasting at St. Thomas More Church on Saturday, November 17th (noon – 4 pm). Why not join in this event and support a great cause? 50% of the ticket prices, in addition to 10% of orders taken at the Expo, will be donated to the Saint Thomas More Scholarship Fund. Tickets are $15 in advance and $20 at the door. Also, designated drivers admitted free of charge! We are moving the website content from our earlier web hosting service. The new system will enable us to add news and views as they occur. We will also add information on events and programs faster. We want this site to be your one-stop shop for all things Knights of Columbus. Thirty teams entered into the competition, three from Orange County. In addition to the bocce tournament, there were fun family activities and prizes. The Orange Pumpkins were comprised of Molly Coolidge, Dave Leperi Sr, Javi Guzman and Lana Morgan. The tournament format was single elimination. “We are very thankful to St. Thomas More and the Knights of Columbus for including us in their game day, ” said Colleen Lanigan, Special Olympics Orange County Coordinator. The Special Olympics has shared their event photos with us. View photos. The Orange County Special Olympics announced that the Orange County bocce team, the Pumpkins, won their bracket at the first annual St. Thomas More Parish Game Day on Sunday, May 6. The Pumpkins advanced through two matches to enter the finals of their bracket, and won easily in only five of the allocated six rounds of play.